Wort, the Raidmother and her cute little babies like playing with matches (what could go wrong with that?). They ramp, ramp, ramp, and then throw a giant fireball at your face. 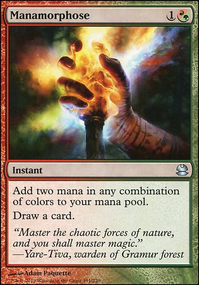 This deck focuses on copying green ramp spells, red burn spells, and token-generating spells. The deck plays very synergistically with its heavy emphasis on sorceries and Instants in order to maximize Wort's ability. The dropdown menus provide more detail into how the deck works. Please provide feedback and up vote if you like it. Wort costs 6 mana so getting her out can take a while. Don't wait for Wort to come online before ramping. Getting her out ASAP is crucial. The deck has a ton of ramp spells so there WILL be more to conspire later. Use any of the 4 or less CMC ramp spells to get to 6 mana quickly. I would only hold off on Crop Rotation , Harvest Season and Primal Growth as the first one doesn't really ramp you unless copied and the latter two are so much better when you have a token to sacrifice. Nature's Lore , Farseek , and Skyshroud Claim : Great because they can fetch Cinder Glade or Sheltered Thicket . Grow from the Ashes , Search for Tomorrow , Cultivate , Kodama's Reach , Harrow and Explosive Vegetation : Can only fetch for basics but are still great at getting you to 6 mana for Wort. Myriad Landscape and Blighted Woodland : Ramping lands. They move a little slowly but are low opportunity cost to run since they take up land slots. Also, in the early game don't be afraid to play some of the value weenies. At the very least they'll provide early game chump blockers and a little extra burn or token production. If they stick around for a while they can provide great value. Young Pyromancer : Makes more tokens for conspiring with Wort. Guttersnipe : Provides burn forcasting sorceries and instants which is exactly what this deck is designed to do. With Wort out now comes the fun part: copying spells for crazy amounts of mana and tokens. Card draw an disrupting opponents are also important in this phase. Nissa's Renewal : Larger ramp spell that can propel you into the late game. Harvest Season : New from Amonkhet, this spell can fetch you a lot of lands if you've already copied a spell with Wort this turn. Boundless Realms : When conspired this card basically pulls every basic land out of the deck. Blasphemous Act , Volcanic Vision and Hour of Devastation : boardwipes to keep opponents from going out of control. Fiery Confluence : can flexibly be used for artifact destruction, a mini boardwipe, or extra burn. Beast Within and Krosan Grip : Green removal staples. Artifact Mutation : Doubles as both removal and token creation. Decimate : this spell is massive card advantage even when not copied. Hull Breach : Another Gruul removal staple. One shortcoming of aggro decks is that they tend to run out of gas as you play out your hand. Card draw helps keep wort fueled with options. Tormenting Voice , Pirate's Pillage and Cathartic Reunion : the card ditching cost only has to be paid with the original spell. When copied these rummaging spells give you great card advantage value for only 2 CMC. Manamorphose : when copied this spell both ramps you and gives you 2 cards. Apex of Power : offers massive temporary draw while giving you 10 mana back to cast those spells. Harmonize : green card draw staple that gets you 6 cards when copied. Shamanic Revelation and Rishkar's Expertise : Creature-based card draw that draws a decent amount of cards even if Wort and her babies are the only creatures out. Rishkar's Expertise is particularly good because it will give you 2 free spells when copied. Skullclamp : The deck produces quite a lot of 1/1 tokens, making them great sac fodder for this card draw engine. Sylvan Library : It's ability to dig through the deck is incredibly useful, particularly in the early game while you're trying to get Wort online. So how do Wort and her babies actually win? By burning s*#t down! Giant X spells and hordes of tokens with haste burn out her enemies. Comet Storm , Fall of the Titans , Banefire , Devil's Play , Jaya's Immolating Inferno and Clan Defiance : X burn spells that go right to the face. Can act as removal in a pinch but I much prefer to use these as finishers. Primal Command : When copied this tutor can fetch two creatures. Search for the deadly Purphoros and Avenger of Zendikar combo to finish off opponents. Firecat Blitz and Tempt with Vengeance : Produce massive armies. Firecat Blitz is particularly good because of the flashback. Leave 2 red mana open after casting it and then immediately cast and copy it again by sacrificing mountains. Kittens for days! Avenger of Zendikar : in this deck, Avenger often creates 20+ tokens on the spot. Deadly with Purphoros, Impact Tremors, Goblin Bombardment, or Burn at the Stake. Second Harvest , Saproling Symbiosis , and Mogg Infestation : token doublers that get out of hand quickly. Devastating when paired with Burn at the Stake, Impact Tremors, or Purphoros. Burn at the Stake : when doubled this spell deals 6 damage per creature. It only takes 7 tokens to deal 42 damage, killing someone at full health. This deck easily gets far more than 7 tokens. Impact Tremors and Purphoros, God of the Forge : Standard red burn staples. Spit out a bunch of tokens and burn opponents for the win. Rude Awakening : with so many lands out, may as well turn them into an angry army of mountains and trees. Mizzix's Mastery and Past in Flames : turn your graveyard into a giant bomb waiting to go off. Easy to win on the spot of either of these resolve. Kessig Wolf Run : makes even a 1/1 token terrifying in this deck. Xenagos, the Reveler : turns tokens into a massive amount of mana to pump into an X spell. Also can create a token for more conspiring. Early Harvest , Battle Hymn and Mana Geyser : Provide huge boosts of mana helping X spells deal enough damage to finish off opponents. Goblin Bombardment : similar to purphoros and Impact Tremors, this sac outlet turns all your tokens into extra burn. Reiterate : I try to avoid infinite combos in my decks. I find I get bored of them too quickly. Reverberate , Fork , and Howl of the Horde : I found that one shot spell copiers were unnecessary. Increasing Vengeance stays because of its great flashback ability. Rampaging Baloths and Omnath, Locus of Rage : the deck used to have more of a landfall theme. However I found the token generation to be too slow for what I needed. They were fun to play with though. Siege-Gang Commander and other goblin cards: these would be great in a goblin tribal build. However they were too low impact for what I was trying to do. Fury Storm from Commander 2018 is exactly the kind of spell copier the deck wants. Wort has a tendency of getting hated out of play a few times to prevent me from "going off". Fury Storm just keeps getting better each time Wort gets hated out. Even if it "only" provides a couple copies of a spell, that is typically more than enough to burn opponents out. Fantastic addition. Apex of Power from M19 is a great card advantage spell that gives the deck the gas it needs in the late game to get the job done. Commune with Lava is great but one disadvantage is that it doesn't also give you the mana to cast the cards you have temporary access to. Apex of Power is effectively a "free" spell, giving you 10 mana to use for the new cards you've drawn. I'm typically winning when I cast Apex of Power and have Wort out. I've also put Hour of Devastation back in the deck as I was finding the deck was a little light on boardwipes. Especially when Wort gets hated out, I need to be able to clear the board until I can get her back out.